Dr. Harlan is a board certified general psychiatrist who provides care to adult individuals. 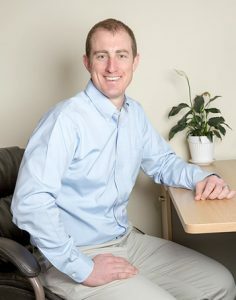 He takes an active approach in the care of his clients, focusing not only on pharmacological solutions to improve outcomes, but also behaviors that can positively and negatively impact successful care. Dr. Harlan encourages patients to avoid complacency; he challenges patients to be the best they can be and focus on the things in their lives that they can control. While Dr. Harlan is concerned with pharmacological solutions, he recognizes the challenges of compliance, mental health stigma, and medication side effects. His approachable style is paramount in helping patients feel comfortable sharing any concerns they have about recommended or current treatments. He specializes in managing anxiety conditions as well depression, bipolar, substance use, ADHD, and schizophrenia. Dr. Harlan is currently accepting new patients. He accepts all major forms of insurance. Please contact us at 724.934.3905 to schedule an appointment. Dr. Harlan grew up in Wexford having graduated from North Allegheny High School. He briefly headed south where he received his Bachelors in Science from the University of North Carolina at Chapel Hill. Shortly thereafter he returned to the northeast for his medical degree from Case Western Reserve University in Cleveland, OH. Dr. Harlan then went on to serve his country in the United States Air Force for 10 years as a psychiatrist before his honorable discharge in 2015. He returned to his roots in Pittsburgh and has worked in community mental health before joining New Directions in 2018. He resides in Wexford with his wife and three kids.